Bursting with natural light and scenic views of your outdoor space, a sunroom is a place to relax, converse, and enjoy everything summer has to offer. If you’re having trouble decorating this space, don’t feel bad. These rooms often require a little consideration to become perfect. This article offers fresh sunroom decorating ideas to pique your creativity and inspiration. These ideas are listed by the most expensive to the least; whether you have pennies or thousands of dollars to spend, you can create the cheerful space you’ve been craving. Sunroom decorating ideas are very subjective, especially when it comes to furniture; think about how you and your family will use the space. Do you envision long, quiet hours of reading and relaxation, or can you see yourself eating barbecued hamburgers and chatting at a table? Since comfort is a serious consideration of a sunroom, you may benefit from at least a single reading chair or a conversation set, even if the room’s main purpose is dining. Let the temperature requirements and the specific sunroom decorating ideas you wish to implement dictate the materials of your furniture. Sunlight and humidity are primary concerns for most sunrooms. As such, many homeowners choose outdoor patio furniture in favor of more traditional materials. Don’t worry if none of these items sound appealing. 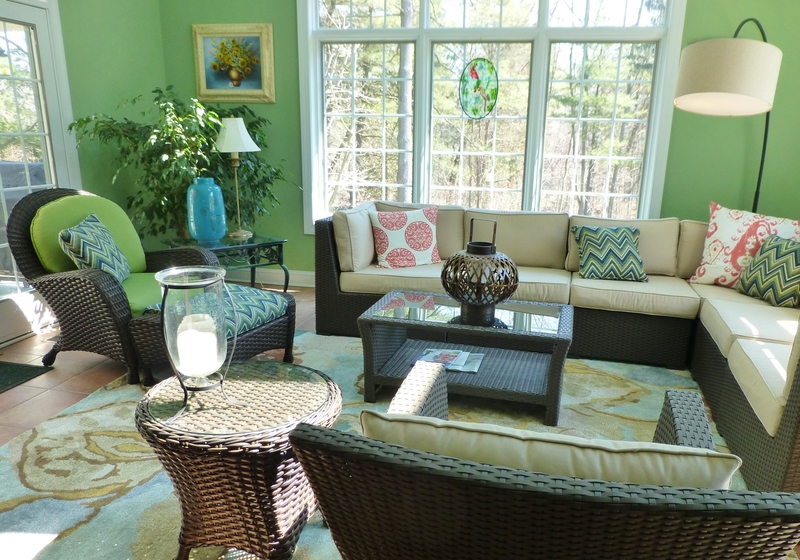 If your sunroom is adequately shaded and insulated, you can still use traditional furniture. Like furniture, flooring is the foundation for implementing your sunroom decorating ideas. The flooring you choose depends on several factors, such as your style, the level of direct sunlight in the room, insulation, and your budget. Tile has been used in sunrooms for decades. There are literally thousands of options to choose from, including pavers tile, ceramic tile, and porcelain tile. Porcelain has become a popular choice only recently. These hardy tiles are waterproof, scratch-resistant, and are typically very resilient to weather extremes. In addition, you can also use durable, temperature-resistant stone and concrete. Carpet is an excellent choice if your sunroom possesses adequate UV protection and heavy traffic is not a serious consideration. Wood and laminate can complement any sunroom beautifully but should only be installed if the space is adequately insulated. Give your sunroom a professional touch by creating a “wow factor” unique to your style. This can include a stunning feature wall, chandelier, decorated ceiling, or even an old art collection you’ve been dying to showcase. Many designers draw inspiration from other rooms inside the household. Likewise, if your home is themed, continue that theme to the sunroom. For example, if you crave a beautiful French country conservatory, consider choosing paver’s tile as a focal point and complement your theme with reupholstered, vintage pieces. Creating a simple “wow factor” is one the greatest sunroom decorating ideas you can possibly implement. Elegant sunroom with blue furniture. Source: Segomego. There’s a fine balance between implementing your home’s current style and suppressing the natural appeal of sunrooms. Don’t be afraid to choose accessories that enhance the beauty of this unique transition space. Experiment with different textures to tie in themes from your indoor living area with the natural beauty of your garden. Selecting the perfect paint is one of the simplest yet most important sunroom decorating ideas to implement. Most designers recommend choosing light neutrals for sunrooms. This will reflect the room’s natural sunlight, give you the freedom to accessorize uniquely, and it will keep the focus on the outdoor space. Whites, creams, grays, and navy are common choices for sunrooms. However, paint boldly if your style calls for it. For example, if your goal is to create a tropical resort, consider choosing bright and airy colors, such as light yellows, pinks, and blues. If you’re still struggling to find inspiration, take a cue from your favorite accessories indoors, such as pillows, paintings, or knickknacks. Vibrant green sunroom. Source: Robinson Interiors. While the main focus of a sunroom is usually the gorgeous outdoor space, adding a few potted plants can enhance the room’s ambiance. Plants are excellent accessories for several reasons, including increased air quality, aesthetic appeal, and fragrant scents. The species of plant you choose will depend on the amount of sunlight and the other sunroom decorating ideas you wish to implement. Just like outdoor plants, indoor flora requires specific humidity and sun coverage. Hanging plants such as ferns and spider plants. Tropical plants such hibiscus and passion flower. Low maintenance plants like African violets. Don’t be afraid to stray from the beaten path to create the style you covet. For example, if your dream is to create a Victorian conservatory, bring in popular plants from the period, such as roses, jasmine, or Boston ferns. The best sunroom decorating ideas come from your own tastes and inspirations. Consider how the room will be used and what your goal is. This can help you determine critical pillars of your design, such as furniture, flooring, and paint. Once you’ve established the basics, you can layer the room with focal points, accessories, and plant-life to create a unique space. Consider your style and the room’s specific requirements when selecting these items, such as sunlight, weather, and your geographic location. Decorating your sunroom can be daunting at first, but if you draw inspiration from the styles you enjoy most and implement fresh sunroom decorating ideas, you can create a beautiful space to spend your summer.